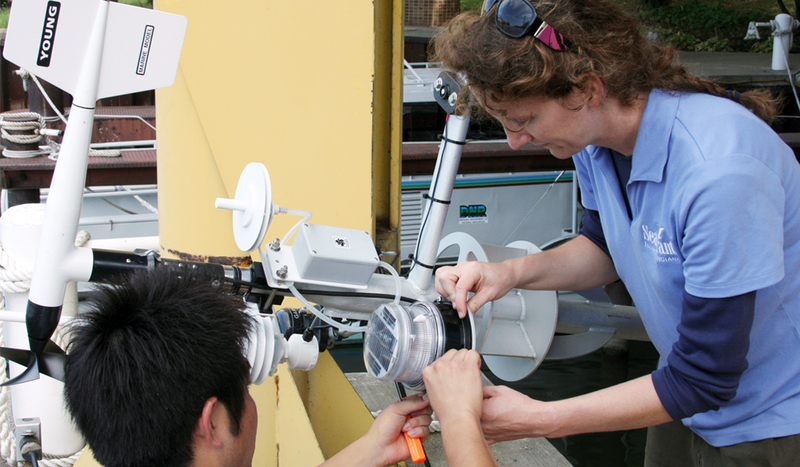 Carolyn Foley repairs a lake Michigan weather buoy. Illinois-Indiana Sea Grant (IISG) is proud to support two real-time monitoring buoys in southern Lake Michigan, one located just north of Michigan City, Indiana and the other near Wilmette Harbor, Illinois. Recently, users have started pitching in with donations to help keep the buoys afloat. The buoy program started when a Purdue researcher pointed out that there were no real-time data being collected in Lake Michigan’s Indiana waters. A few years later, concerned citizens and sailors pointed to a similar need for the Illinois shoreline. Now, the two IISG buoys are filling information gaps for anglers, sailors, swimmers, and weather professionals who are interested in this part of the lake. Over the years, buoy users have made phone calls, emails, and interactions through Twitter and Facebook to share that the buoys are valued and needed. We at Sea Grant have enjoyed hearing how our fans use buoy information. All told, lake enthusiasts are checking our real-time buoy data nearly 30,000 times per year! Putting a buoy in the water, year after year, requires many things to happen. Weather conditions, equipment, people, and technical services have to come together perfectly to keep the buoys operational. This program would be impossible without sufficient funding. Sea Grant’s buoy managers, Carolyn Foley and Jay Beugly, try to support the buoys with grants, but those funds can be hard to come by. When the unexpected happens, like a power-generating solar panel comes loose, or it takes three trips to remove a hook found tangled in wires at a depth of 30 feet, we burn through our funds pretty quickly. IISG is constantly on the lookout for partnerships to help keep the buoys afloat, but you can also make a donation. The funds raised will go directly toward the buoy program, supporting data charges, travel costs, repairs, and upgrades. Already, folks are stepping up and donating to keep the buoys operational.